This looks like a piece of cake but it is really a dense bar cookie, all dressed up to look like cake. It sure is good, too! Speaking of which, did I mention that I’m giving away 100 appliances as my big annual Christmas giveaway? Yup. Seriously. Head over to that post and enter when you’re done reading this one. I’ll put a link at the bottom of this post for ya. In other daily news from the Jordan household, Katy and I have started our penmanship course. She thought it was just for her but was pleasantly surprised to see me running off two copies and sitting down beside her to practice each day. She is at the perfect age to learn a pretty cursive script and my handwriting is atrocious. My mother’s generation and those before her always had such beautiful handwriting and part of this is because penmanship was taught in school back then. I’m hoping to be able to give the gift of a beautiful hand to my daughter – and it certainly can’t hurt me to improve! I’ve been practicing as I sign Christmas cards and even posted a few photos on my instagram. I’m signing several a day and hope to be done in a week or two. My handwriting is nowhere near pretty but it is definitely legible, which is a huge improvement for me :). Ready to cook? Let’s go hop in the kitchen! Last one in has to do the dishes! 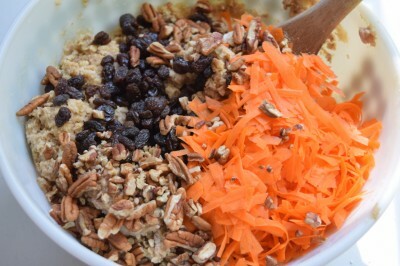 You’ll need: Baking mix*, Oats, Butter (or margarine), Brown Sugar, Pecans (optional), Vanilla, Carrots, Cinnamon, Ginger, Allspice, Eggs, and Raisins. *For baking mix you can use Bisquick, Pioneer Brand, Generic like I have pictured, or even my recipe for homemade Better For You Baking Mix that is in my Come Home To Supper cookbook. I try to keep a batch of it in my fridge but we go through it so fast that I never seem to have it when it comes time to do a post! 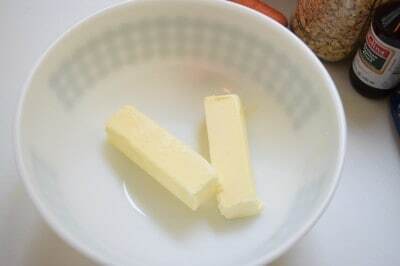 Put your butter in a large mixing bowl and melt it however you feel led to do so. 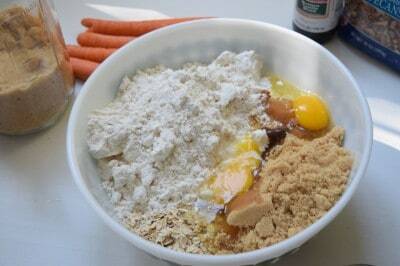 Dump in your baking mix, brown sugar, eggs, oats, and spices. Note: Actually measure out your baking mix. I tend to eyeball mine so sometimes my bars are a little on the dry side when I put too much in. I should measure things more often. I’m sure I will resolve to do that after this post…and for about five minutes I’ll be sincere and even adhere to that resolution. Then I’ll decide they are good either way and get over it. Stir that up real good with a big spoon. The traditional way of doing this is to use a grater but I didn’t feel like digging for mine so I just peeled them and kept on peeling until I had this. When I got down to a little carrot nub I gave it to Zoey. I’ve never seen a dog like carrots like she does. 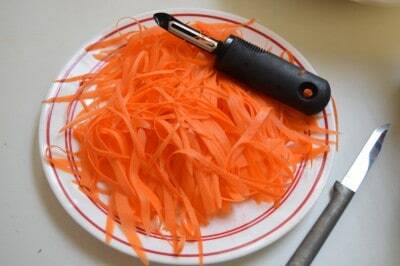 Then I chopped that up a bit. Toss that on top of your dough along with the raisins and pecans. I miss the old days when pecans were affordable enough to be able to snack on them. I do actually have two huge pecan trees in my yard but have yet to get a single pecan in all the years I’ve lived here. Part of the problem is my fat and happy squirrel population and another problem is that they aren’t the best producers. I need to put something on the soil around them but I’ve ready varying reports of what, when to apply, and where to get it. If any of y’all know what this is and where it is readily available, give me a holler in the comments and maybe I can end up with some pecans after all :). Stir that again until it is well mixed. See this? It was taken in my back yard. How beautiful is that? 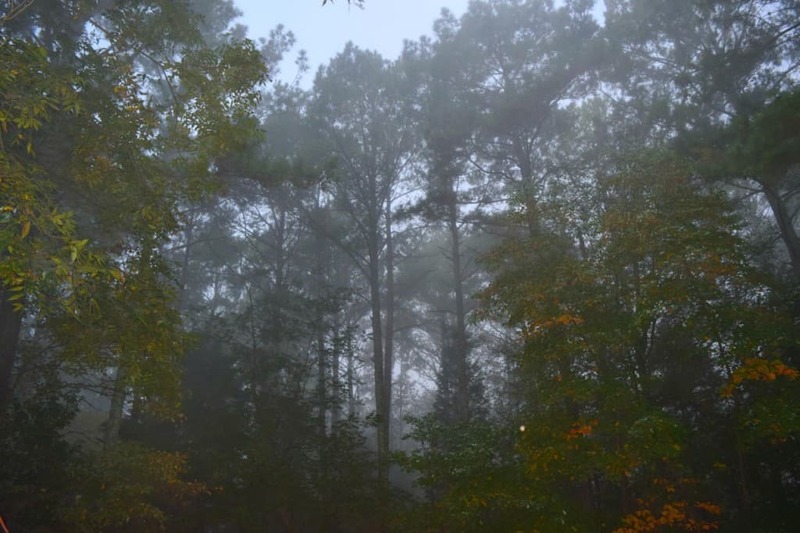 The fog was rolling in and made it feel like I was in the Smoky Mountains. This scene is what I’m talking about when I talk about getting outside to put your problems in perspective. I look up and see how much bigger than myself it all is and all the trivial issues I’m dealing with seem to shrink back down to their actual size. We weren’t meant to live our lives under roofs and surrounded by walls and when we reduce our world to that tiny space, of course small things seem bigger and we lose our sense of the true scale of life. This is why some of my best therapy consists of walks outside. God can reach me so much more readily there – because that’s where I really shut up and listen. Pat this out into a greased 9×13 pan. Bake at 350 for 35-40 minutes, or until golden. Now, ice it with cream cheese icing. After icing, I like to sprinkle some pecans over top. Now see this serving size? This is for pictures, folks. Don’t cut your pieces this big. This is a big old chewy brown sugar and butter cookie bar iced with cream cheese icing. If you eat this big old whomping piece you’d likely die of sugar overload. Now I’m not saying that isn’t a good way to die, but it isn’t your time yet. 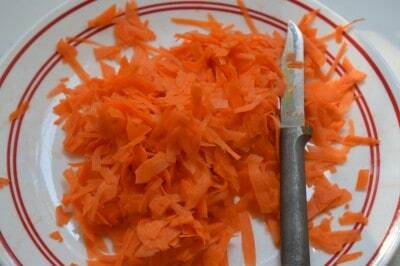 Cut a smaller piece – or cut this size and spread out the eating part a bit. 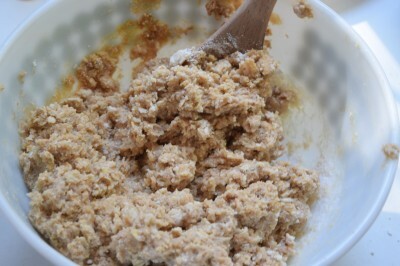 Combine baking mix, sugar, oats, and melted butter in large mixing bowl and stir by hand until dough is formed. 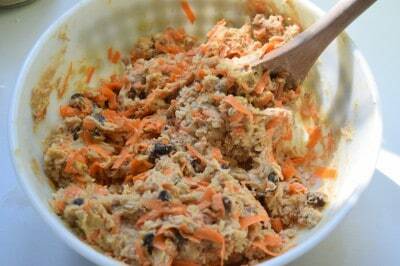 Stir in carrots, raisins, and pecans until well mixed. Pat into greased 9x13 pan and bake at 350 for 35-40 minutes, or until lightly golden all over the top. Remove from oven and allow to cool. 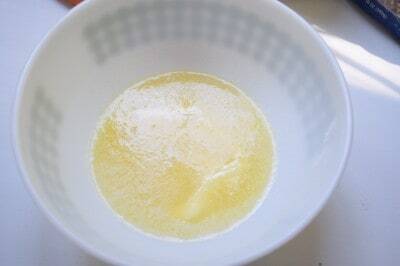 Place softened butter and cream cheese in large mixing bowl. Beat with electric mixer until well blended. Slowly add sugar, a cup or so at a time, and beat until light and fluffy. Mix in vanilla and lemon juice as well until well blended. Ice cooled bars. Anyone know about the stuff to put around pecan trees to up production and where to get it (readily)? Also, how far along are you on your Christmas? Do you have plans to simplify this year and if so, what are they? And that sweet lady that I met at Becoming who works in Knoxville and reads my posts at work…if you see this will you leave a comment so I can shoot you an email? You gave me a letter. Yes, you 🙂 You also gave me your business card but you’ve been reading me long enough to know that organization is not one of my spiritual gifts:). Don’t forget to visit my big Christmas giveaway! 100 Appliances are up for grabs. I start drawing winners next week and will give away ten appliances each weekday for two weeks. Get your daily chances in now by clicking here for details. BIG 100 Appliances Giveaway from SouthernPlate and Hamilton Beach! I can’t believe you need encouragement but I guess that makes the rest of us mere mortals feel a little better! I love your recipe posts and sharing your personal thoughts makes it even better! Have a great day in Alabama! We are having a cloudy day here in Georgia! Ahh bless you. I assure you I’m probably a lot more mortal than you are, lol. Thank you so much for taking the time to chat with me and I’ll be waving at you and my husband’s family over in the great state of GA! what do you mean by “all-purpose baking mix”?? I make pancakes and waffles from scratch and generally don;t buy mixes. I can;t even remember the name of the stuff I used to buy when my children were small and hungry. The brand name Bisquick works really well. My homemade baking mix recipe is in my “Come Home To Supper” cookbook but I am afraid it hasn’t been posted online yet. 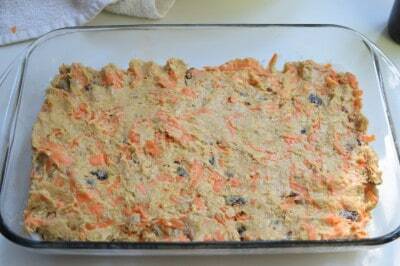 the Carrot Cake Bars look amazing, but the raisins are not listed in the ingredients…how much should I use? So sorry about that! I do about a cup. And you to me, Jean! thank you! I loved your newsletter this weekend! And this looks amazing, but truly I dislike raisins with a sincere passion, could you sub in crushed pineapple? Thanks for all the encouraging words you share with all of us. Hey Kim! You have a few options. 1. Just leave them out altogether. There isn’t anything you need to substitute. 2. Use dried cranberries or even dried cherries in their place. 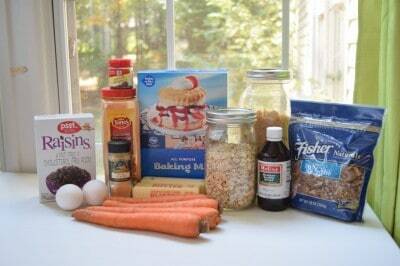 Raisins were left out of original recipe, as I like raisins with carrots/cake how much/how many, I’m guessing 1 cup?? I agree. Raisins are not on my list of edible items. Dried cranberries sounds great though! I so look forward to your words of encouragement and great recipes God is so good to allow us to have Rays of sunshine in our lives to give us a boost when we need it most. Thank You for your time and keep up all the wonderful things you do. Can’t believe you have CHRISTMAS done and wrapping I wish I could say the same. Oh it is a rare thing for me to be this far ahead but it does feel good. Thank you so much for being a ray of sunshine in my life! This turned out beautifully–thanks! btw…pecans STILL are affordable as snacks when you consider the density of protein per serving, the true food value, the realness of that snack! what the human body cannot afford is greasy, artificial chips and cookies baked 6 months ago, packaged and treated with preservatives we can’t pronounce! Keep spreading the word–homemade is best for all the right reasons! I guess I’m thinking about the old days when we had bags and bags of pecans in our freezer. Nowadays I just buy them when I need them for a recipe. I’m the only one who likes to snack on them so I won’t spend that kind of money just for me – that’s why I still buy cheese :). We seldom buy chips because no one really eats them in my house. But you have a great point! Thank you for putting into words why I feel at times I must escape to be outside. I work in an office with no windows…and have for over 5 years….so when my work day is over, I run for the outdoors to exercise. I call them my “devils’ run” yet really, I’m just trying to hear the Big Man a little clearer!!! Perspective is everything on a chaotic day. I love getting on your site with all your wonderful, simple recipes. I love the pictures you post on how to do each step. It is nice seeing the recipe coming together. Love readiing all your readers replys. Kee p up the good work. Looking forward to many more recipes to try. Christy, there has been so many times your words lifted me up or made me laugh through the tears I was crying. You are a blessing to so many. may God lift you up in his strong arms and give you the blessings that you give so many. Check the website for the Alabama Pecan Growers Association as a source for advice regarding your non-producing pecan trees. Christy, you always seem to be able to know what to say when I am down. It has been a rough year losing my Dad and trying to clean out my parents house. So many times the memories are overwhelming and I have been known to go back and reread many of your posts for inspiration. I also am not one that was blessed with the gene from my mother of organization, but I am improving some(wink). I to am almost finished with Christmas shopping, just buying for a few this year, we only buy for the kids, even though they are almost grown. Thanks again for all of your hard work and all the laughs you give us each day. One step at a time is all it takes, with some deep breaths and fresh air. Keep in your heart all the good memories. My dear Mother died twenty years ago, but I have her jewelry box and every time I open it I see her wearing the pieces and that makes me smile..
As I was reading your column, I was thinking – “gosh, what encouraging words she is writing,”… then I read other comments and see it is not just me… thanks. On the pecan trees, I used to have some in my back yard and annually in Jan or Feb I would go to the co-op and buy fertilizer (13-13-13), lime and ZINC and put around each tree. It might be better for you to talk with Extension Service and let them advise you. It may need soil sample to get you started correctly. Again, thanks for all the good work that you do. I live in Alabama near the coast. We fertilize with the triple 13 in February. I think you are very admirable for taking on homeschooling (I’m a former teacher and could never teach my own). Good luck and hope you have many blessings. You are a wonderful encourager! Have tried to sign up for giveaways .no luck keeps throwing me out. Is there a problem with the site? Getting the Christmas “stuff” out of the way is a good idea, so much less stress, less likely to impluse buy, and best of all you get to use that time to spend it with family and doing the other things that make Christmas. Decorating, baking with the children, just nice warm fuzzy things. Gifts are nice but people remember “moments”. They look so delicious, Christy. Thank you for giving of so much love to us, in so many ways. Thank you for caring…it comes through in everything you do and say. I wanted to tell you that I tried your Smokey Chicken this weekend and it was really good. A coworker bought me my first ever bottle of Bob Gibson’s White BBQ sauce to have with it, I haven’t ever tried it before but it was a new experience for my whole family. It will take some getting used to, but since we live in Charlotte NC it’s not like we are going to get a chance to eat it very often. Also tried your burger slaw to have with it, I love the slaw, it is awesome, however, it was a bad decision to have so much vinegar based foods at one time, but going to cook both of them again. Me and a co-worker look forward to your emails each day, you make our days brighter, so thank you for all your wonderful and bright thoughts each day, they do make a difference in people’s lives. My husband’s parents live in Boaz. Just down from Huntsville and they also have Pecan trees. Don’t give up on your pecans. The trees do not produce every year. Sometimes they only produce every three years. That’s just how they are. They are temperamental. Sometimes they get tons, sometimes very few, sometimes they don’t get any for a few years…. It depressing for me when that happens because I have to go back to buying them and then I realize just how luck I have been when I see the price I have to pay for them…even at Costco…I’d much rather spend at day picking them up then paying that outrageous price! Kinda like picking those wild blackberries during the summer! LOL! I have always enjoyed reading your blog, and was amazed at your grace and strength, when you had to deal with your two broken legs. Nine days ago, I was hit by a car, and my leg was broken. I am alone, in Las Vegas, in a cheap motel, with no insurance, and, have not even been to the Dr yet for follow up check up since the trauma center released me the night of the accident. I had just gotten a seasonal mall job, and life was good. I was wondering if you can ask your readers for prayers to be sent my way, as I need the good Lord to hear them very loudly. I know it will all work out, but, it is scary right now. I am trying to get social services to help me, but it is a lot of red tape, and, they have their hands full with all the people who need help. I thank you for listening and I admire you. Thank you so very much. I know there are a lot of good people out there. Thank you so very much. From so far away, I feel your prayers. Christine, you are NOT ALONE! The Lord hears your heart and cares for you. Prayers are going up for you from South Carolina! Thank you Mary. I got the wheelchair donation today. I am praying I will get to the Dr. soon and that I won’t need surgery. Each step is a new prayer. I am taking it a prayer at a time. I agree with you completely about the necessity of spending time outdoors. Good for what ails you. Good for what ails all of us. 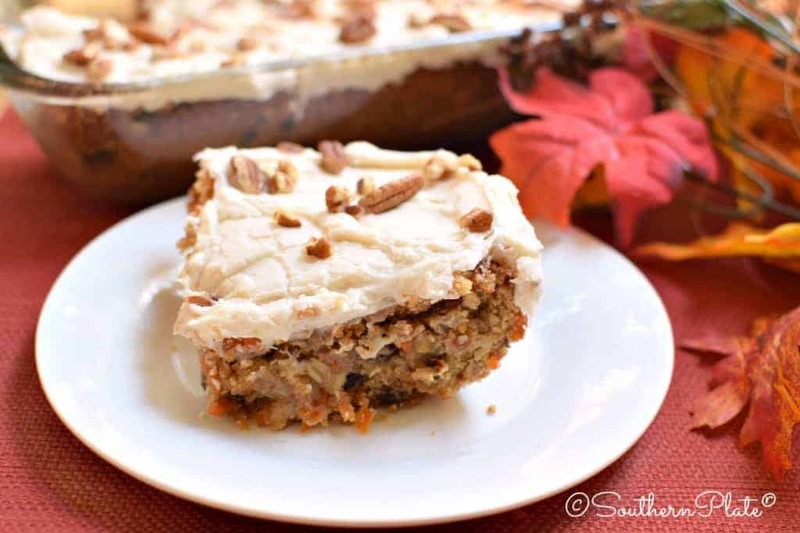 Can’t wait to make these Carrot Cake Bars for our church’s soup kitchen, do the bars freeze well? How does the icing freeze? Wondering if I could make seseveral and ice them up before placing in the freezer. My grandpa had a method to boost production when pecan trees got lazy. He drilled holes around the base of the tree, in the ground, and poured some lye down each hole. It must have worked because his trees would set a bountiful crop the next year after this treatment. If you were squeamish about using lye, a triple 10 fertilizer might do the trick. Great recipe!!! My father-in-law LOVES carrot cake! Thanks for helping me win points with him! Also, pecan trees shave to be sprayed on a certain schedule to produce pecans, check with your local extension office! Oh what a gorgeous view from your backyard! It must be such a good feeling to look up through those beautiful tall trees to the heavens. I can see how a calm feeling would come over us and we would only want to be quite and listen. Thank you for sharing this view. Hey I just wanted to let you know that I have been using some of your recipes and thought to encourage our young mothers at church to “Bring their Babies to the Table” I Love that your recipes are so easy even a beginner can do them but so GOOD a seasoned cook (that’s what I call my self instead of old) will prepare them over and over. I sing your praises all the time. WHAT A BLESSING YOU ARE!!!!! We used a product called Pecan Blend before the growing season, then ammonia nitrate after the fruit has set. I think this is just a dormant year for our trees. 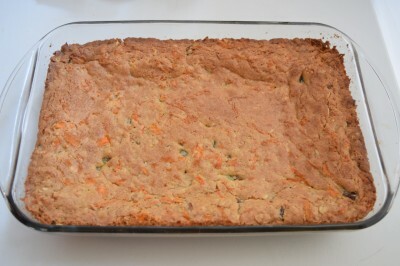 I am going to try these carrot bars at Thanksgiving, along with the sweet potato dumplings you posted awhile back, they were delicious! Christy. I love your recipes and most of all your stories about your family. In looking at the carrot bar recipe, the directions refer to raisins, but I don’t see any listed in the ingredient list. Is it to taste? This is no big deal but I suffer from the “proofreading eye syndrome ” of being a former English teacher. Keep the recipes and stories coming! I love that picture looking out in your backyard. You keep so many of us upbeat even when things get up down. Bless your heart! I LOVE your post and look forward to it every day. Thank you for all the wonderful recipes you share with us! If you find out what to do for your pecan trees, please share.